As some of you know, I have been leading the open source popHealth project at MITRE for the past 4 years. The MITRE popHealth team is currently working for the Veterans Health Administration (VHA). Our work is focused on using popHealth as the software service allow the VHA to meet Meaningful Use Stage 2 certification for Clinical Quality Measures (CQMs). Since we hadn't been working on popHealth in any substantial level in most of 2013, so we identified some problems for ongoing operations and maintenance (O&M) of the popHealth software when we started to put more and more engineers back on the project. The concerns that the popHealth team had was the software that manages the User Interface (UI) presentation layer in the browser was becoming too complex and convoluted. This had the potential for introducing difficulty when a non-MITRE contractor will eventually manage the popHealth software in an "O&M" mode for the VHA. This will happen when our team completes the development task and moves off of this project. 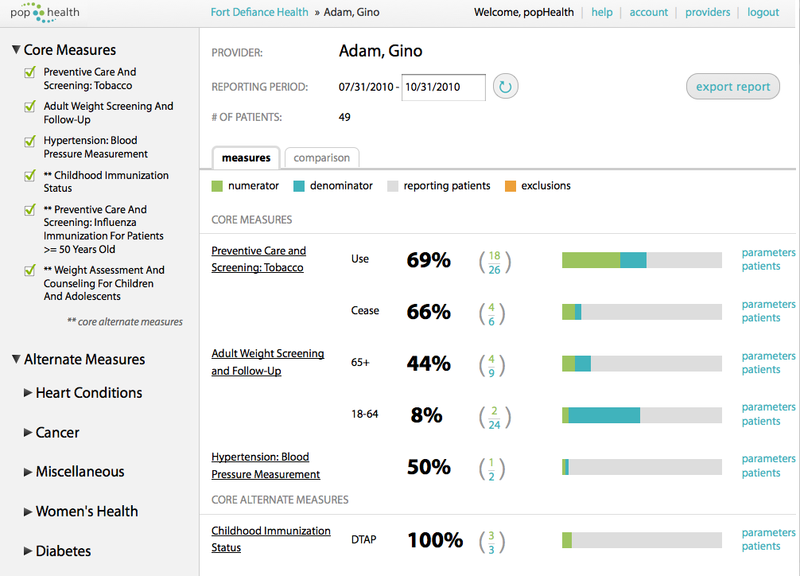 In the process of refactoring the popHealth web application infrastructure, the team opted to introduce some tweaks to the popHealth presentation layer but still maintain the existing interaction model. What we decided to do was only slightly evolve the existing popHealth branding and look and feel, so that is is more maintainable from an engineers perspective, but does not introduce a radically different interaction model require re-training for all our existing users. 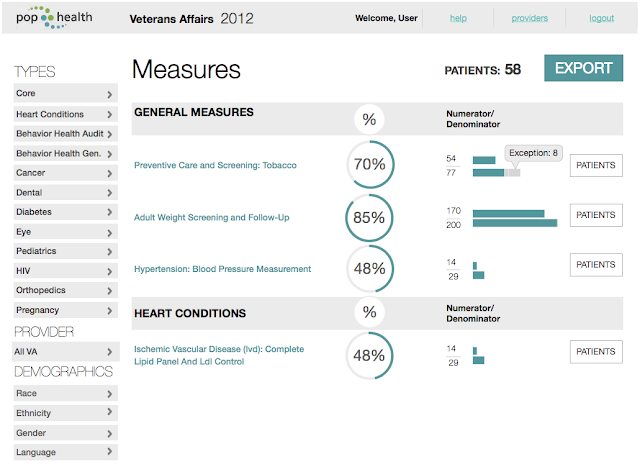 Eliminated confusing links for the "parameters" of each CQM on the right; now, there is just a link to access the patients. If anyone has opinions on the latest designs, the team welcomes any and all constructive feedback. This work is licensed under a Creative Commons Attribution-NonCommercial-NoDerivs 3.0 Unported License. © Rob McCready, 2013. Looks great , any timelines when this will be available on demo and gitub ? Most of the dashboard HTML and CSS code is already available on the master branch today. Some tweaks for properly displaying the performance rate bar chart may come next Friday, November 1st. The other popHealth views will have the same tweaks to the design and will be coming over the next ~1… possibly 2 months. It will all look consistent at that point. Thank you for these posts. We have been trying to use PopHealth as a reference for our own tool. We have set up both the old 2.1 version (with a patch, Issue #98) and the version that is currently on the master branch at GitHub (2.4?). Our goal is to be able to give the tool some valid QRDA 1 files and have it output QRDA 3. Assuming we get a valid QRDA 3 out, we would then use the Ruby measure calculation and export code as a reference for our own development efforts. * Version 2.1 Seems to calculate measures but we can't find any controls that allow us to actually export a QRDA 3. * Version 2.4 Seems to calculate measures and has an export button available. However when pressed, it produces a ruby server that appears to be trying to use some code that has not been written. Keep in mind that 2.4 has no deployment documentation so we had to do a lot of educated guessing with the 2.1 docs to get it setup. Do you know where we can get complete working Pophealth package? Something that includes recommended Pophealth source, known working QRDA 1 sample files and instructions on how to use the tool to output a QRDA 3? Was this released ? Last I checked there was no QRDA3 and QRDA1 export in pophealth . Was it added ? I have just checked and the QRDA Category 3 export code has been available for several months. The QRDA Category 1 can only be imported into popHealth, so there are no plans for QRDA Category 1 export. It appears that a v2.4 tag still has not been released. I suggest you engage with the open source popHealth community and ask about release plans.